LEADING coatings supplier Hempel has released a new solvent-free epoxy coating for the interior of storage tanks and pipelines. Specified for temperatures up to 93 deg C/200 deg F, the new coating enables oil and gas companies to store and handle high temperature crude oil and water without risk of contamination. “As oil companies drill deeper, their need to handle higher temperature crude oil increases,” explains Kunal Nadkarni, group oil and gas segment manager at Hempel. 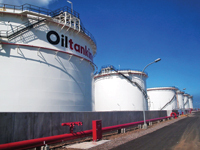 “Crude oil that is deep underground can reach temperatures up to 90 deg C. But ordinary coatings can’t handle these temperatures and the subsequent damage to the tank could result in cargo contamination. That’s why we developed Hempadur 35900,” adds Nadkarani. A two-component solvent-free high-build amine-cured phenolic epoxy, Hempadur 35900 does not release VOCs (volatile organic compounds) into the environment during application. This means it adheres to the strict environmental regulations in the US which, according to Nadkarani, are being adopted increasingly in other countries. Hempadur 35900 conforms to the latest Norsok M-501 rev 6, system 7A, B and C, and has already been approved by some of the world’s largest oil and gas companies. Released earlier this year, Hempadur 35900 has been optimised for use with airless spray and brush (touch-up). It can also be applied with a very high dry film thickness, which means it requires fewer coats than solvent-borne alternatives and can be used for bottom rehabilitation of old tanks. The salient features of Hempadur 35900 are: recommended for the interior of tanks, pipelines, etc; specified up to 93 deg C/200 deg F; solvent-free/very low VOC; simple application in very high film thickness; available in light colours for easy cleaning and inspection; and Norsok approved. The Hempel Group is a leader in the production and sale of protective coatings within the marine, container, yacht, decorative and protective market segments.